Bring home WGN America’s bold new drama Manhattan: Season One, on Blu-ray™ (plus Digital HD), DVD (plus Digital) and Digital HD April 7th from Lionsgate Home Entertainment. Featuring strong performances by Rachel Brosnahan (TV’s “House of Cards”) and Michael Chernus (TV’s “Orange Is the New Black”), Manhattan: Season One, provides “a cleverly imagined portrait of the men and women who were at the center of that peculiar sovereignty” (Alessandra Stanley, The New York Times). 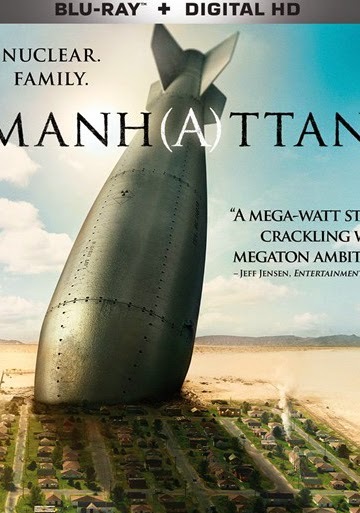 Set against the backdrop of the mission to build the world’s first atomic bomb, Manhattan follows the brilliant but flawed scientists and their families as they attempt to coexist in a world where secrets and lies infiltrate every aspect of their lives. Blu-ray and DVD bonus materials go behind-the-scenes of the set, fashion, history and “making of” Manhattan with multiple featurettes and also include select episode audio commentaries with the cast and crew. All 13 episodes of Manhattan: Season One, will be available as a 3-disc Blu-ray and 4-disc DVD. I can yes, I am enjoying what I have seen, it's a nice piece of the past. Olive Films: REMEMBER APRIL'S RELEASES! Chuck Norris is WALKER TEXAS RANGER! Lionsgate: TWO FILMS OF A DIFFERENT FEATHER!